Gas builds up in a storage disk around a black hole, eventually leading to a bright X-ray nova. Astronomers have spotted a rare X-ray star explosion near the center of our Milky Way galaxy, revealing a previously unknown black hole munching on gas from a neighboring sun-like star. NASA's Swift satellite made the cosmic find last month when it detected a new and rapidly brightening X-ray source a few degrees from the galactic center of the Milky Way. 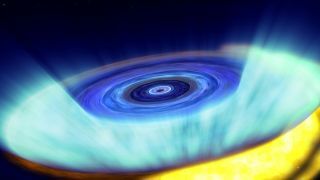 Astronomers identified the outburst as a short-lived bright X-ray nova, which is produced when a stream of gas rushes toward either a neutron star or a black hole. Unlike a supernova, which is the explosive death of a star, novas are smaller explosions that do not completely destroy a star. The black hole is thought to be 20,000 to 30,000 light-years away in the galaxy's inner region. Astronomers, who named the bright X-ray nova Swift J1745-26 after its coordinates in space, said witnessing such an event is rare. At its peak in high-energy X-rays on Sept. 18, the nova reached an intensity equivalent to that of the Crab Nebula. While these rays dimmed, the nova brightened in lower-energy emissions detected by Swift's X-ray Telescope through at least the beginning of October, according to NASA. Additional observations suggested that a black hole was at the center of this radiation flare-up. "The pattern we're seeing is observed in X-ray novae where the central object is a black hole," Boris Sbarufatti, an astrophysicist from Milan's Brera Observatory who currently is working with the Swift team, said in an Oct. 5 NASA statement. "Once the X-rays fade away, we hope to measure its mass and confirm its black hole status." Swift J1745-26 with labels and scale of moon as it would appear in the field of view from Earth. This image is from September 18, 2012 when the source peaked in hard X-rays. The Swift team believes the black hole is part of a low-mass X-ray binary system, in which gas flows from a star into a disk around the black hole, spiraling inward and heating up greatly as it heads toward the center. But a cosmic glitch can disrupt the steady flow of gas and cause it to accumulate in the outer portion of the disk like water behind a dam, according to NASA scientists. After enough gas has built up (often over several decades), the disk can switch to a hotter, more ionized state that sends the gas rushing toward the center of the black hole, creating the X-ray nova.